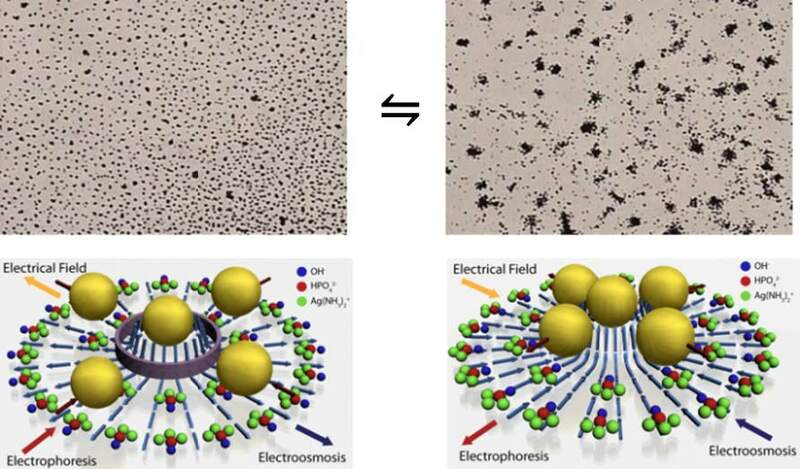 Silver phosphate micromotors exhibit reversible transition between two collective behaviors: repulsive dispersion-like “exclusion” and attractive clustering-like “schooling” by the addition and removal of NH3. Hierarchical particle clustering is observed when other inert particles are also present. Upon the addition of NH3, large Ag3PO4 microparticles function as pumps, pushing away inert particles from their vicinity. We also find that the transition from dispersion to clustering can be halted with UV light. By combining the two external stimuli, we demonstrate that micromotor systems can be used as logic gates, with stimuli (UV and NH3 in our system) as inputs and collective behaviors as outputs: “schooling” and “exclusion” behaviors as 1 and 0, respectively which suggests their potential for applications in computations.